I grew up in the tiny little town of Touws River where this aerial photograph (24k jpg) was taken at about the time when I was born, showing my birthplace. My family and I are presently staying in Wellington (95k jpg) in the Western Cape Province of South Africa. In this 400mm telephoto shot (65k jpg) which I took from the top of the du Tiotskloof pass, you can just see my house. My home language is Afrikaans, the world's youngest Germanic language which, together with Hebrew and Indonesian, are regarded as the world's three "wonder languages" to have originated in less than 50 years. By strange coincidence my birth-town and present hometown together with my wife's college and residence as well as our present employers and my hobby, are all connected as far back as 1882 with people as far away as England and America and "bodies" as distant as Venus and the Sun. Click here for the full story - of hier vir die Afrikaanse weergawe. I am employed as an Electronic Technician at the South African Astronomical Observatory's Cape Town head office. 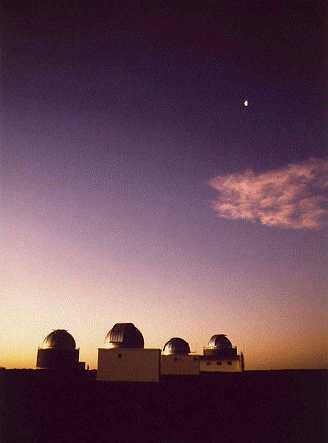 At times I need to visit our observing outstation near Sutherland where I took the above picture which is now used as the cover of our Observatory Brochure. We normally drive there via the historic town of Matjiesfontein (77k jpg). As you can see from my favourite links, my main interests are astronomy, telescope making, satellite tracking and photography which includes video. To assist me in some of these, I have written a few simple computer programs over the years which you are welcome to download and try out. My main sport interests are rugby and cricket as a spectator and I do a little cycling for fun. Illustrated page showing a Vesta webcam being modified for astronomical use. Similar modifications and tests were done to 1004x Surveillance Camera. from an old fashioned Texereau to a more modern truss split-ring equatorial. CoSaTrak (304k) - Computerised Satellite Tracking - control a telescope for Tracking Satellites. astro.zip (46k) - General positional astronomy program with real-time Alt/Az output. cell.zip (29k) - By David Chandler for doing 9, 18 & 27 point flotation mirror cell calculations. extract.zip (20k) - Program for selectively extracting satellite elements from big element files. gematria.zip (55k) - I once wrote this Gematria (theomatics) calculation program for a friend. with a Smoke-stack Implosion (192k gif) of an old power station near Cape Town. See footage of a "collision" between the brightest satellite and the brightest star .. (full story). this rare event, next to happen again in 2004. Taking the C out of CCD! on how we identified and cured our CCD contamination problems. mostly tell a story, either individually or as a group. people sent me lots more crazy road sign pictures. Gedurende Sept. 2000 het ons klomp Koortse reunie gehou! This is my procedure for determining focus and exposure time for astrophotography. Here are some Resolution Tests done on a Snappy Video Capturing Device. I have collected quite a lot of Snappy Software and Patches. One of the first implementations of my Snappy was to capture a "collision" between Mir and Sirius.